The film opened on a peaceful, isolated alien planet where the agrarian Ba'ku people lived with a population of only 600, specifically in a small area of space called the Briar Patch; it was revealed that a joint group of Federation and Son'a teams (cloaked in special reddish-orange uniforms) were secretly surveying, monitoring and culturally observing (or spying from a duck-blind position) the race of people, and reporting "physiometric data" to Federation Starfleet Admiral Matthew Dougherty (Anthony Zerbe). While on the planet conducting observations, Lt. Cmdr. Data (Brent Spiner) went out of control and revealed himself and the outside presence to the astonished Ba'ku, and the Son'a officers were subsequently 'taken hostage' by Data; Dougherty alerted Capt. 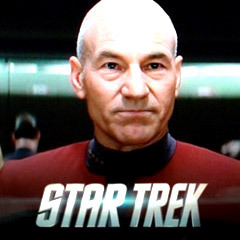 Jean-Luc Picard (Patrick Stewart) on board the USS Enterprise-E about Data to help them control and repair the dysfunctional android, and then reported to Son'a leader and ally - Ahdar Ru'afo (F. Murray Abraham); Picard decided to detour the Enterprise to the region and safely capture the malfunctioning artificial life-form Data himself within 12 hours ("I should be the one to do it. I'm his captain and his friend"), after he was found attacking in a mission scout ship and was destined to be destroyed by Dougherty and Ru'afo. During his mission on a shuttlecraft to disable Data, Picard discovered radiation particles concentrated in the planet's rings but that "the metaphasic radiation of the rings is in a state of extreme flux" (the radiation was later revealed to reverse the aging process). After taking Data safely into custody with the help of Cmdr. Worf (Michael Dorn), Picard beamed down to the surface of the Ba'ku planet with members of his crew, where they found the peaceful people in the small village (a "sanctuary of life") had "incredible mental discipline, clarity of perception" - they were in harmony with nature, had rejected technology, and were enjoying the benefits of long life (adults were over 300 years old) through the rejuvenating and regenerative 'fountain of youth' effects of their planet ("the promise of perpetual youth"). Picard was ordered by Dougherty to return the hostaged Son'a officers and then leave the area immediately; it was revealed that Data's 'positronic brain' was damaged (causing its malfunctioning) when fired upon by a Son'a weapon, and Picard returned to Ba'ku to more fully investigate, where he found strong "neutrino emissions" emanating from a lake -- there, he, Data and villager Anij (Donna Murphy) discovered a suspiciously-cloaked Federation vessel (or holoship) with a holographic projection - a gigantic flying holodeck that recreated the Ba'ku village! ; Picard surmised that earlier, when Data discovered the vessel, he was shot and damaged - and that the purpose of the duplicate hologram was to deceive the Ba'ku people; there was a secret conspiracy to move them en masse off the planet and forcibly relocate them on a similar planet without them ever realizing it. Picard confronted Dougherty directly - he was determined to stop the forced relocation, report and file protests to the Federation Council, and end the conspiratorial exile-threat to the Ba'ku (an obvious violation of the Federation's Prime Directive) - although he learned that Dougherty was in on the scheme to relocate the small numbers of people in order to exploit their planet (Picard asked pointedly: "How many people does it take, Admiral, before it becomes wrong? "); ignoring Admiral Dougherty's direct order to return to his previous mission, Captain Picard ordered Cmdr. Riker (Jonathan Frakes) to take the Enterprise from the Briar Patch area and report to Starfleet Command, while he took a support craft (of five crew) to the surface to help the defenseless Ba'ku people evacuate to protective caves to prevent their forced transport. As the Ba'ku people fled to avoid capture, they were individually isolinearly-tagged by robotic probes; Ru'afo sent two ships to intercept (and attack) the Enterprise - Riker defensively counter-attacked and destroyed and disabled them using a dangerous maneuver in a red cloud nebula; meanwhile, Picard and his romantic interest: an injured Anij, were transported with other Ba'ku onto Ru'afo's ship, where Picard was threatened by Adm. Dougherty with a court-martial, although Dougherty was the one who ordered an attack on his own Federation ship. The villainous, vengeful and merciless Son'a leader Ru'afo was determined to launch long-range harvester-injectors toward the inhabited planet which would wipe out the Ba'ku - when it was surprisingly revealed that "the Son'a and the Ba'ku are the same race" with identical DNA; many years earlier when two youngsters named Ro'tin and Gal'na, Ru'afo and Gallatin respectively, had been in a group of offland-leaning young people that tried to take over the colony but failed, they were exiled - and had now returned in a "blood feud" - "the children have returned to expel their elders just as they were once expelled." When Adm. Dougherty told Ru'afo to end his scheme: "This mission is over," he was killed in the face-lift device of the ship's 'bodyshop'; Picard convinced Gal'na to not support "madman" Ru'afo's scheme to commit an atrocity ("You can still go home, Gal'na"); during the countdown for the injector-harvester activation, Ru'afo was deceived when his ship's bridge was made into a hologram (after it was transported to the holoship) - when he discovered the trick, an enraged Ru'afo transported himself to the injector; Picard initiated the injector-collector's self-destruct system, destroying Ru'afo in the resulting explosion and barely escaping with his own life by beaming aboard the Enterprise. Riker reported the good news to Picard that the Ba'ku evacuation was being halted by the Federation Council pending a top-level review; the remaining Son'a crew negotiated a cease-fire/surrender with Picard, and decided to return to the planet and live among the Ba'ku - the beginning of a slow healing process, especially for Gal'na; before leaving, Picard promised to see Anij again during his 318 days of upcoming shore leave. The third film of the second TNG series. No Academy Awards nominations. Considered by critics as no better than a TV episode. With a production budget of $58 million, and box-office gross receipts of $70 million (domestic) and $112 million (worldwide). With the tagline: "Eternity is Closer Than You Think"
Great Scene(s): The breathtaking scenes in which Picard and love interest Anij used perception to almost freeze time for a 'perfect moment': the first time next to a waterfall, and the second time to keep her alive after a cave-in rock collapse.